NEW YORK CITY, NEW YORK -- In the final hour of Day 2 at New Balance Nationals Indoor on Saturday, one of the meet's best competitions was heating up. 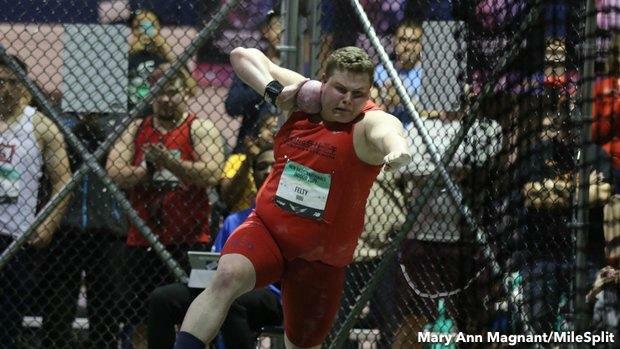 And while the boys shot put didn't have the consistent drum of the crowd -- conversely, cult fans of the throws huddled together in the back corner of the Armory where the cage sits -- there was no arguing the blue-chip battle taking place between two of the country's top high school throwers. From the moment the competition began, Innovation Charter's (MA) Aiden Felty had felt the pressure being placed on his shoulders by Patrick Piperi, of The Woodlands (TX) High School. Felty, the nation's No. 1 thrower, had opened with a 65 foot, 9.75-inch mark. But Piperi, who was US No. 2, wasn't far behind with an opener of 64-0.25. "That's what we both needed," Felty said. "We put the pressure on each other." From there, the event became an internal monologue between each thrower, with Felty finding his rhythm in the circle while Piperi chased. Each went into the finals with the same opening mark. It wasn't until Piperi went into the cage with one throw left that he found another level. "I had to make him work for it," the Texan said afterward. The Woodlands senior, a University of Texas signee -- who's brother, Adrian, was runner-up at the NCAA Championships for the Longhorns over the weekend in Birmingham, Alabama -- landed a then-leading 66-3.75 mark. Felty finally felt that figurative "moment," when a challenge must be matched with a big throw. "I think it goes back to all my training and all my practices," Felty later said. "I try to practice the same routine every time I go into the circle. I would say, probably out of 10 of my throws, seven of them were in the exact same. So I knew I needed to hit a big one." After he prompted a slow clap from fans watching just outside the cage, Felty unleashed his best mark of the day a 66-8.75 mark that sealed his first national championship. "I knew on that last one I had to put something together," Felty said. "That's what made me do it." In a lot of ways, too, that proved validation. Felty had been one of the country's best success stories over the last four years, going from a 33-10.75 as a freshman, to 51-1.25 as a sophomore, to 57-4.75 as a junior. Felty was the nation's best as senior. And now he had the national title to prove it. "It's kind of funny," he said. "When I was a freshman and sophomore, even last year. They (guys around the country) were throwing so much further than me. I was a big MileSplit list guy, and I'd be like, 'I'm kind of catching up with them. Oh no, they're 10 feet further than me.' And so for me to catch up. My game plan is to move up a lot every year. I wasn't good as a freshman. I wasn't really great as a sophomore. Even as a junior, I was all right. For me to catch up, that means a lot to me." Meanwhile, in just his third competition of the indoor season, Piperi claimed a career best indoors, too. Anna Hall is a self-admitted perfectionist. That shouldn't be surprising to hear from a multis athlete who owns two high school national records in the outdoor heptathlon and indoor pentathlon, though it doesn't make it any less true. 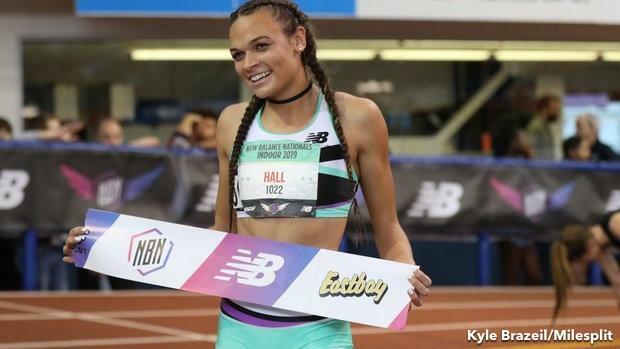 So the Valor Christian (CO) senior and University of Georgia recruit had one key goal heading into New Balance Nationals Indoor on Saturday: Improve on her national record pentathlon score of 4,302 points. Of course, things don't always go to plan. "Honestly, like mentally, after the morning went so poorly I was really frustrated, and so I think that was a really big learning day for me, learning how to pull it back together," said Hall, who scored under her expectations in the long jump (18-3.75) and shot put (38-2.75). And that's what she did in her final two events, eventually scoring 4,209 points to win her third straight national title in New York while also scoring the second highest point total in the event's history. Olympian Kendall Williams, a multiple NCAA Champion for Hall's future school Georgia, formerly held the meet record with 4,068 points. Hall went 5-11.5 in the high jump before closing with an impressive 2:16.52 in the 800m. "I'm not going down without a fight," Hall said she told herself when the long jump and shot put didn't go to plan. "I know this isn't the total score that I want, but it can still be good." When Leena Morant took the baton for Union Catholic High School in the final 800 meter anchor of the Championship SMR, she could sense, from the corner of her eye, someone watching from the infield. "I think that definitely helped," Morant said. And no doubt Sydney McLaughlin was a presence. Wearing a white New Balance zip-up jacket, the newly inked pro was fully engaged in her former team's race to the finish. As Morant rattled off laps with more and more gusto, McLaughlin's encouragements began more pronounced, her claps a little more ferocious. "I was just trying to keep the lead for these girls," Morant said. "They did their job. I was just trying to do mine." In the end, Union Catholic, which also featured Sydney Tucker (200m), Khamil Evans (200m) and recent Union High School transfer Chidumga Nkulume (400m), claimed its first national title since McLaughlin in 2017, winning the Championship SMR in 3:58.46 -- the team would later earn a national title in the Shuttle Hurdle Relays after multiple teams were disqualified, including national-recorded setting Western Branch, which broke 30 seconds. "I'm really proud of us," Morant said. "Everyone did their job."